Hard work, speed and the ability, in the words of one NFL scout, "to knock you silly" enabled Pope to star at Fresno State and carve out a successful 10-year career in the National Football League, including four seasons with the San Francisco 49ers. _Recruited by Jim Sweeney out of Long Beach Poly High School, Pope arrived at Fresno State weighing 170 pounds. But he built himself into a standout 190-pound safety with the Bulldogs and was taken in the second round, with the 33rd overall pick, by the San Diego Chargers in the 1992 draft. _Pope was a three-time All Big West first-team selection for the Bulldogs, and a two-time conference defensive co-Most Valuable Player as a free safety. 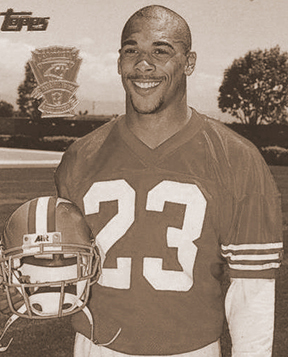 He played both safety and cornerback in the 1992 East-West Shrine Game, finishing with six tackles for the victorious West team coached by Sweeney. _Bulldogs fans might best remember Pope for blowing up San Jose State's 2-point conversion attempt in 1990, preserving a 31-30 Fresno State victory and propelling the Bulldogs into the California Raisin Bowl. _Pope is the only player to wear the jersey of four California teams in the NFL. He played for the Chargers (1992-93), Los Angeles Rams (1994), 49ers (1995-98) and Oakland Raiders (2000-01). He also spent a year with the Cleveland Browns (1999). _His best season undoubtedly came with the 49ers in 1996, as he made six interceptions and scored the only touchdown of his NFL career. His career NFL statistics were highlighted by 129 games, 19 interceptions and 240 return yards.